Igor Pavlov would struck a bell when the dogs were fed. Dogs learnt to associate the sound of the bell with food. After a while, at the mere sound of the bell, they responded by drooling. If your behavior leads to negative outcome, it’ll be suppressed. e.g. if you find a wrongdoing in other branch of your office, report it to your supervisor, but he orders you to ‘mind your own business’, then next time you’ll ignore it. By seeing how other people get punishment / reward, you change your behavior. e.g. if your subordinate is getting reward by speaking fake praises of Boss, you’ll feel inclined to do the same. If a person believes something, he’ll behave accordingly. But there is long distance between belief and behavior. Recall belief is part of attitude (cognitive component). Attitude is in close proximity to behavior. So if we can change attitude, we can change behavior=>behavior change=>nation/society changed. HOW? If an expert shows a snake and says “it is non-poisonous”. Then your cognitive component is altered. You’ll not run away, may be you’ll walk away but won’t run away. (behavior, changed). At the same time, it doesn’t mean you’ll grab the snake in your arms and start to fondle it but still behavior is changed. Two models for predicting behavior. Through an experiment in USA during the heydays of racial discrimination. Hotels, restaurant owners were sent letter “if Chinese couple coming, will you receive them? Most owners replied “no”. (=Racial prejudice) However, when a Chinese couple was sent to those hotels, majority of the owner received them well. Owners feared negative media limelight. Same way, if you’re health conscious, you’ll avoid junk food at home but may be at friend’s private party you’ll eat junk food or even drink desi liquor, because of peer-pressure. Bottom line: Relation between attitude and behavior is not straight forward. “social influence / peer-pressure” matters. We all have dislike for salesman and tele-callers. If they call you, you’ll put down the phone without thinking of consequences. When you’re disinclined to “think” (you’re in low-cognitive mode), and accessibility is very high (you’re immediately putting down the phone). Behavior prediction possible? Yes, in all such cases you’ll put down the phone if low cognitive and high accessibility. But in reverse case, difficult. As we learned strong attitude helps predicting behavior easily then weak attitude. Even if people are in minority but they’ve e strong attitude towards a cause, they may force their will upon others. Consider some labour reform that will help 90% of the workers in unorganized sector. But still Government may not implement It, fearing that labour unions (from organized sector), will begin strikes. (doing “strike” is behavioral component). But from above question and answer, it’s difficult to predict whether the respondent goes to Church mass every Sunday. So, let’s ask him a “specific” question- Do you like going to Mass every Sunday? If he says “yes”, then easy to predict he likes Church, he may be doing charity to the poor, he’d be avoiding seven cardinal sins and so on. Thus, event is only “one” (going in Sunday Mass), but helps predicting many things. Tamils are proficient in maths. Punjabis are alcoholic party lovers. Prejudice is formed by negative-stereotyping. E.g. all the Nigerians in Goa are drug dealers. If that prejudice is guiding your behavior. E.g. refusing to give NOC to a Nigerian person rent a house in your cooperative society. Students were divided into two groups- (1) wearing yellow shoes (2) wearing red shoes. There is no difference in them, except shoes color. Subsequently, red-shoe group students began badmouthing about yellow shoe groups e.g. those students are lazy/notorious/bully and so on. And vice versa. So, this is my group so everything is justified (in-group), and since he is in other group, everything is wrong in with him (out-group). Humans are not different. race, religion, regions etc. just like red shoes vs. yellow shoes. As society develops, the explicit prejudice begin to decline. but some negative things may be reflected in his facial expression, body language etc. Even himself may not be aware of it. Same way, in urban India, while there is no untouchability , you’ll find it during renting of rooms, selling of property etc. In 2009, Bollywood Actor Emaraan Hashmi said he wanted to buy a house in the posh Pali Hill but the housing society refused to give him the NOC because he is a muslim. Although Society administrators claim they did not give him NOC because his ‘serial-kisser’ image will be a bad influence on the teenagers of the society. For Either case Mr.Hashmi is facing prejudice (A) because of his religion OR (B) because of his on-screen image. Advertisement Using ads, you change attitude of a person to make him like/buy your product. Mass campaign To get juntaa support, you’ve to change their attitude. e.g. Modi = Gujarat; Attack against Modi = attack against Gujarat. In Bangladesh open defection is very less. They built pit-latrine- that’s safer than open defecation and cheaper than conventional toilet. But in India, many villagers have bikes, TVs and mobiles but not toilets at home and they don’t feel guilty about it. Even if Government builds toilet for individual house in the village, the family may use it as ‘store-room’. Pouring money can’t help. Hence Swatch-Bharat Abhiyan has enrolled celebrities to change to influence people. National Health policy has a component: “De-stigmatization of mental disorder”. Otherwise no amount of money can help rehabilitate a cured mental patient =attitude change required. National Skill policy- person will do post-graduation and remain unemployed but may not learn ‘welding’ to earn money, because for his attitude is: “education =graduation and all other trades are inferior.” So, unless we change that attitude, he is less likely to enroll for any skill Development program. Therefore, Information-education-communication (IEC) components must be included in all Government schemes and policies for changing attitude of people. Government giving medical insurance to people.- they’re free to use any sarkari/private hospital. Dr. Armatya Sen says “attitude change” must be inculcated if Government wishes to opt public provision route. Because we are a socially backward country. Many feudal structures still running. Cook may be of any caste, yet child will have to eat. Students from all caste and religion will sit together and eat. Thus, A child develops ‘tolerant/inclusive’ attitude towards other castes and religions. Unsuccessful in Pakistan because people’s attitude towards immunization is negative. They think it’s against Islam, or American policy to make Pakistanis infertile. Thus Attitude change important for civil servant, because he is a leader, he is a policy maker in the society. American is one of the largest GHG emitters in the world. Their industrialists/academicians are in ‘climate denial’- that global warming /climate change / environmental problems are fictional theories. They’re adopting this ideology to prevent cognitive dissonance. Self-perception: Juvenile will not be sent to jail but to rehabilitation home, and ordered to do social service in old-age house. Impact? He’ll feel good about himself. We attacked his “B” component, his “A” and “C” will change automatically. (remember CAB model from E2/P1). Dissonance theory By planting an idea that challenges the contrast in your beliefs e.g. tax evasion is same as corruption. So tax evader will either try to justify his action or change his tax-evasion behavior. Learning theory By actively persuading others. but if you’re doing maths your elaboration level will be high. So depending on your place in the elaboration spectrum, your persuasion capacity will change. Advertisement works on people in low cognitive capacity mode. But it doesn’t have long lasting effect, so today you bought one brand mobile, after six months, another brand. In governance, people have to be convinced during their high cognitive mode, for long lasting impact. It is the communication intended to make other person believe or do something. The success of persuasion depends on three factors: (1) source (2) message (3) target. Trust worthiness: After terrorist attack, religious leaders ask devotees to maintain peace. Because people more likely to follow ‘guru’s order’, than collector’s order during such crisis. Similarly for increasing voter’s turnout or increasing cleanliness- you’ll have to rope in celebrities, spiritual leaders etc. Because if municipal commissioner says keep the city clean, very less will follow. (Hence Modi’s idea of nominating 9 people for Swatch Bharat). Doctor tells Obese person – “you should stop eating rice and your weight will reduce by 15 kgs in a month”, then obese person more likely to follow it, than same advice by his neighbor. If your elaboration level is very high / your cognitive capacity is very high, then you’ll question each and every point even if propounded by an ‘expert’. e.g. if you’re on an operation – table, you shouldn’t ask the surgeon whether he sterilized the scalpel! Message should be simple compared to the capacity of the audience. Gadar Movement: They simplified the “Drain of wealth theory” in their pamphlets and newspaper. Catchy Slogans required: “Kutch nahi dekhaa toh kuchh nahi dekhaa”- to promote Gujarat tourism. Foot-in-the-door: if you want a big favor, ask for a small favour first. E.g. to borrow laptop from a friend, first borrow his book and return it unharmed to win his trust and confidence. Ego defense Never challenge the ego of target- e.g. showing God/Godess portrait in jewelry ad = good, but in shoe-ad= your persuasion will fail, audience will not buy your product. Neutral attitude Voter turnout is low: People are not ‘hating’ democracy. They’re neutral about voting- they are lazy, want to enjoy public holiday, believe their vote won’t make any difference in the outcome. EC will have to organize the hoardings and street-plays accordingly- to connect with the youth, to connect with the rural masses. After communal riots, the society is polarized, you can’t change mood by putting hoarding. Anne Franke’s Diary, Nazi War-memorial: Even a pro-Nazi will feel dissonance- and see how precious each human life is. Self-persuasion Ask a student to explain to the class, “why is smoking bad for health.” Then during adult life, that person will resist smoking even under peer-pressure. Persuasion in peripheral route: when you buy biscuit, since they’re cheap, you won’t do market research. Just go and buy. Persuasion in central route: while buying home, computer or car- you’ll do analysis of various products, persuasion will be difficult for salesman. But once convinced you’ll go ahead and buy. So, if your attitude towards democracy is changed in central route, then it’ll have long lasting impact. You’ve to design message accordingly. Convince people that message is relevant to them e.g. “pro-development, anti-corruption” ideology. Nowadays, those are the buzz words and even erstwhile casteist and communal parties are forced to toe that line to make people vote for them. 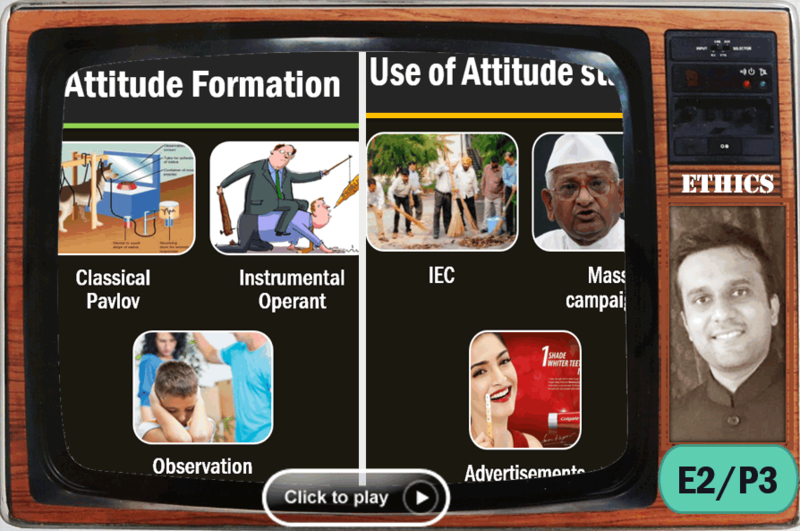 In the next part (E2/P4), we shall look at the case studies and mock questions related to Attitude. Mrunal sir plez suggest a book for ethics,aptitude integrity paper……pleeeeeeeez? is it worth to study.reason why i am asking is because i have seen many negative reviews about the book. I have finished all the NCERT and most of my cultural part along with Bipin Chandra and M .Laxmikant and my optional paper 1st it took me 8 months to finish all this but the problem I am facing is that I fail to recollect things ” Now today, when I took it again for re-reading, I felt like I have forgotten almost everything I read. If this has happened with just one lesson, how am I supposed to remember such a vast syllabus? I have been preparing for CSE for well over 8 months now. But when I take things for revision, I feel like I don’t remember a thing. This leads me to read those things again and again. How can I reduce my time for revision and make the most of my first reading itself? If possible, give some strategies to prepare for each subject. Make bulletin notes out of what you have read in a notebook or wordpad file in your computer. Include only the keywords. This will help you in remembering as there is less “content” to remember & it all appears ordered in a neat, concise way. Revise the notes from then on instead of the whole book. Our brain likes to structurize things so the moment you read the first two points of a topic, the other points will pop up in your mind because it’s part of the list of things you made. Some people prefer making notes on the side of the text books itself. This also works. Find the approach that suits you. Making notes in a computer file will help you in search and find keywords after sometime and can save you valuable time browsing through notebooks to find the correct page. That’s my two cents for you. bro which optional hav u prepared.. it is in news that UPSC is removing optional from 2016.. do anyone have any confirm news about it.. varna optional prepared kiya bekar jayega..
See! Revision is smthng which you have to do on regular basis! Its better to mark or underline in book if you are not making notes! Best would be to practice answer writing of what you have prepared, then revise the same! Thanks mrunal.org for covering this crucial section. Great work sirjiii :) Keep’em coming. Subbarao book is very boring. mrunal sir..your lectures on economics were awesome…in those videos , you have said there will be mains oriented lectures. plz sir release those lectures if they are.. because you are the best in economy in whole india as far as upsc is concerned . i want to know that i am a hindi medium student and i have problem regarding explanations given on this site.plz suggest me that hindi version of this site is available or not.or suggest me some other good sites. Thanks a ton Sir. Had the posts published few months back, I would not have wasted money for coaching. just want to ask n want advice that can we write in such an open manner in giving examples???? for eg: tooth paste example mentioned above?? ?